A pedestrian talking on her cell phone walked past a stand of broken pay phones last week in New York. With rising cell-phone use and vandalism and neglect taking their toll, pay phones are disappearing in New York City and around the nation. Hawaiian Telcom, the state's largest telephone provider, operates about 5,300 pay phones in Hawaii. While the numbers have declined over the years, as they have nationally, tourism has reduced the erosion rate in Hawaii. There is particularly high demand from visitors from Japan since many of their wireless phones are incompatible with network standards in the United States. 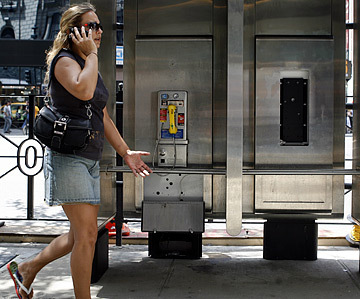 At the same time, demand for pay phones is affected by Hawaii's high wireless penetration. An estimated seven out of 10 people have cell phones in the state. "Hawaiian Telcom believes pay phones are a viable business that serves public need and is part of the total telecommunications solution," Hawaiian Telcom spokeswoman Ann Nishida said. "Not everyone has a cell phone, they can be forgotten or lost and batteries can run low. "In many cases, a pay phone can be more than a convenience but a necessity. There are also 'cell-phone free' zones in places such as hospitals and other facilities, so there is definitely still a market for pay phones.